This gorgeous Butternut yellow 1967 Camero, RS/SS tribute, is accented with white stripes and front blackout. Powered by the high winding small block 350 and backed by a Turbo Hydromatic 350, this car is a blast to drive. Chrome Torque Thrust Wheels and fresh radial T/A tires add to the driving experience. The powered convertible top makes this a stellar sunny day cruiser. Front slotted disc brake rotors make for an excellent balance of torque and stopping power. Subframe connectors have been added to make the frame more rigid. The undercarriage is unrestored however. The interior has been restored containing black bucket seats, SS steering wheel, factory gauges, and AM radio. The hide away headlights add to the look of this beauty. This Camaro is ready to drive daily or take on weekend cruises. 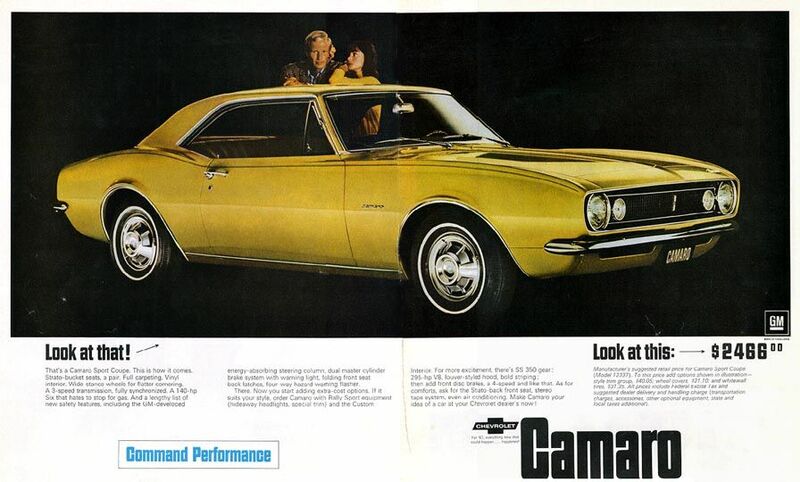 The first-generation Camaro debuted in September 1966, for the 1967 model year, up to 1969 on a new rear-wheel drive GM F-body platform and was available as a two-door coupe or convertible with 2+2 seating, and a choice of 230ci, 250ci inline-6 or 302ci, 307ci, 327ci, 350ci, and 396ci V8 powerplants. Concerned with the runaway success of the Ford Mustang, Chevrolet executives realized that their compact sporty car, the Corvair, would not be able to generate the sales volume of the Mustang due to its rear-engine design.The Camaro was touted as having the same conventional rear-drive, front-engine configuration as the Mustang and Chevy II Nova. In addition, the Camaro was designed to fit a variety of power plants in the engine bay. The first-generation Camaro lasted until the 1969 model year and eventually inspired the design of the new retro fifth-generation Camaro. The first-generation offered a standard, Super Sport, and Rally Sport editions. In 1967, the Z/28 model was added featuring stripes on the hood and trunk, styled rally road wheels, and a 302ci V8 engine.